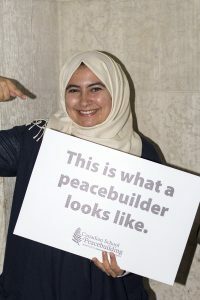 Duha Alassaf is passionate about peacebuilding. It’s this interest that led Alassaf to the Canadian School of Peacebuilding last June. Alassaf, who lives in Amman, Jordan, was searching for professional development opportunities online when she found the CSOP. “I found this program and it just caught my eyes and my heart (because) it’s about peacebuilding,” she said. Alassaf is a master’s student in the human rights and human development program at the University of Jordan. She also works as a health officer with the international NGO Medair. Her work involves assessing the psychological status of Syrian refugees and conducting group therapy sessions with them. At the CSOP, Alassaf took the course Expressive Trauma Integration: Caregiving and Conflict Transformation. She believes the things that she has learned will aid her in her work with Medair. She credited the professor, Dr. Odelya Gertel Kraybill from Lesley University (Cambridge, MA), and the CSOP staff with creating a safe environment for students to learn about sensitive subjects. Alassaf is currently writing a dissertation about using community-based rehabilitation as a tool to promote social justice. She plans to continue the work she is doing, and hopes to return to the CSOP.